This very special boxed set is the perfect gift set for anyone who is a fan of the little engine who most certainly could and his adventures. For those who have been avid fans of the series or have kids who do, you will find that there is a good chance that you will already own most of these, so possibly the set is aimed at new generation of fans. The set is a packed 7 disc affair with the following titles contained within. The packaging for the title looks a though it was aimed to be durable with the original discs and their cases contained in the box so little fingers can get at them without destroying everything in the process. For those of you who have not seen Thomas before, the tales are simple and often contain small lessons for the kiddies about morals and friendship. The rail yard that Thomas lives in is full of interesting characters and the Fat Controller looks after the whole yard. 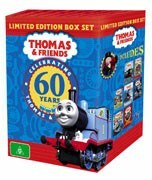 This is a must have set for any fan of ABC kids and Thomas the tank engine!